Yay! Blog Hop time again for the Dream Team of Mo's Digital Pencil! This month our hostess is Alice and she has chosen Pretty in Pink as our theme. Thank goodness I have an abundance of pink in my crafty stash. I chose to use the uber cute Maya's Balloons, coloured with my trusty Promarkers & oodles of glitter. The cat & balloons have been decoupaged for a bit of dimension and I've used dotty papers & matching card candy too. 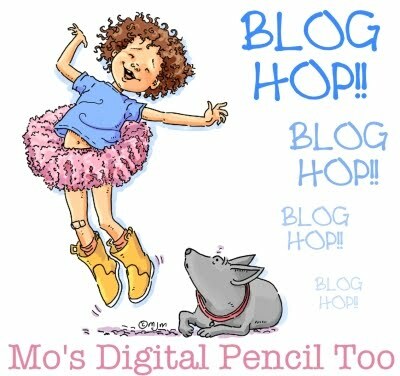 I hope you'll join in with our hop this month & check out the other 'Pink' creations that the team have put together, as always there are $5 vouchers up for grabs for 2 lucky peeps who leave comments along the hop to spend in Mo's Digital emporium. If you're already on the hop then you should have arrived here from the lovely Kerttu's blog, after me, head on over to Julie's fabulous blog for some more inspiration. If you'd like to start at the beginning, then Alice's amazing blog is the place to be. Beautiful card! Love what you did with the edge. Oh what a wonderful card Jane, fab image too. Gorgeous Jane! Cute image and that's a great layout. I love this pink challenge. Every card is like opening a box of bon bons. This is a lovely card. Gorgeous card as always hun! Beautiful, very fresh and clean, lovely colouring too. how adorable. This is a super cute card. Very cute. Love the finish on the balloons. Spotty paper is always a winner with me. I love the stamp and the balloons are great. Lovey card. Oh...I did not know this image yet. How cute! And a beautiful card! Such a gorgeous card Jane - love this image and the dimension of the balloons. What a beautiful card. Nice colors too and a lovely digi. This is so pretty. Love the sweet image you have chosen. Aww so cute! Your coloring is great! I love all the sparkle. Fantastic job. Very adorable. Love the coloring and the gloss on the balloons. Great card - I love the polka dots, the glitter and the decoupage on the balloons! Wishing you a wonderful day today! What a sweet pink card, I love all the details! wow, must be special to be the first one commenting! thei is so cute. i love the tiny pearls. and the glitter. it adds to the cuteness of this card. Woww, wonderful card Jane, love the image. Love, love love this card! Great coloring & embellishments. Like the shaped edge on the bottom. Gorgeous Jane, love the shine on the balloons and such a cute image..very cute. Such a beautiful card. As soon as I saw your card is the fact that any friend of any age would love receiving it. Great Job!! Fantastic card. I love the balloons. Beautiful, I love the balloons, cute! Lovely card Janey! I took a little trip to your gardening blog also...love it! I am an avid gardener & bird watcher from Canada. Such a pretty card. Love the balloons! Such a beautiful card. I love your design and colors. So beautifully colored. Wonderful. I sure do love your image and I do adore cats!! wow another beautiful card, just gorgeous. would hate to have to pick a winner from everyone. i like how you hace done the bottom of the card. What a lovely slightly different image. The background is great. What a lovely fresh make - just gorgeous!! she is so cute! and i love your paper choices, just fun!! Awe this Fabulous!!! My fave color is Pink!!! cute Mo image!! !